Leaders of the Soviet Union and the United States from 1917 to 1991. In 1921, after the Bolsheviks took over Russia, won a Civil War, killed the royal family, repudiated the tsarist debt, and called for a world revolution by the working class, it became a pariah nation. U.S. hostility towards the Bolsheviks was not only due to countering the emergence of an anti-capitalist revolution. The Americans, as a result of the fear of Japanese expansion into Russian held territory and their support for the Allied-aligned Czech legion, sent a small number of troops to Northern Russia and Siberia. After Lenin came to power in the October Revolution, he withdrew Russia from World War I, allowing the Germans to reallocate troops to face the Allied forces on the Western Front. U.S. attempts at hindering the Bolsheviks consisted less of direct military intervention than various forms of aid directed to anti-Bolshevik groups, especially the White Army. Aid was given mostly supplies and food. President Woodrow Wilson had various issues to deal with and did not want to intervene in Russia with total commitment due to Russian public opinion and the belief that many Russians were not part of the growing Red Army and in the hopes the revolution would eventually fade towards more democratic realizations. An aggressive invasion would have allied Russians together and depicted the U.S. as an invading conquering nation. Following World War I, Germany was seen as the puppeteer in the Bolshevik cause with indirect control of the Bolsheviks through German agents. "The fact is that while Germany in a way has been using the Bolshevik element either directly through bribes of some of its leaders or as a result of the principles of government they espouse and practice, Germany is appealing to the conservative elements of Russia as their only hope against the Bolsheviks". Beyond the Russian Civil War, relations were also dogged by claims of American companies for compensation for the nationalized industries they had invested in. By 1922, the Soviet Union was working its way back into European favor. The United States refused formal recognition, but did open trade relations and there was active transfer of technology. The Ford Motor Company took the lead in building a truck industry and introducing tractors together with American architects like Albert Kahn who became consultants for all industrial construction in the Soviet Union in 1930. By 1933, old fears of Communist threats had faded, and the American business community, as well as newspaper editors, were calling for diplomatic recognition. President Franklin D. Roosevelt was eager for large-scale trade with the Soviet Union, and hope for some repayment on the old tsarist debts. He negotiated with the Soviets, and they promised there would be no espionage so Roosevelt used presidential authority to normalize relations in November 1933. There were few complaints about the move. However, there was no progress on the debt issue, and little additional trade. Historians Justus D. Doenecke and Mark A. Stoler note that, "Both nations were soon disillusioned by the accord." Many American businessmen expected a bonus in terms of large-scale trade, but it never materialized. The Soviets had promised not to engage in spying inside the United States, but did so anyhow. Roosevelt named William Bullitt as ambassador from 1933 to 1936. Bullitt arrived in Moscow with high hopes for Soviet–American relations, his view of the Soviet leadership soured on closer inspection. 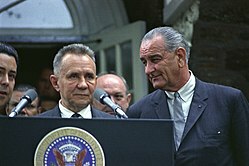 By the end of his tenure, Bullitt was openly hostile to the Soviet government. He remained an outspoken anti-communist for the rest of his life. Before the Germans decided to invade the Soviet Union in June 1941, relations remained strained, as the Soviet invasion of Finland, Molotov–Ribbentrop Pact, Soviet invasion of the Baltic states and Joint German and Soviet invasion of Poland stirred, which resulted in Soviet Union's expulsion from the League of Nations. Come the invasion of 1941, the Soviet Union entered a Mutual Assistance Treaty with Great Britain, and received aid from the American Lend-Lease program, relieving American-Soviet tensions, and bringing together former enemies in the fight against Nazi Germany and the Axis powers. Though operational cooperation between the United States and the Soviet Union was notably less than that between other allied powers, the United States nevertheless provided the Soviet Union with huge quantities of weapons, ships, aircraft, rolling stock, strategic materials, and food through the Lend-Lease program. The Americans and the Soviets were as much for war with Germany as for the expansion of an ideological sphere of influence. During the war, Truman stated that it did not matter to him if a German or a Russian soldier died so long as either side is losing. 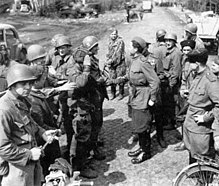 Soviet and American troops meet in April 1945, east of the Elbe River. The American Russian Cultural Association (Russian: Американо–русская культурная ассоциация) was organized in the USA in 1942 to encourage cultural ties between the Soviet Union and the United States, with Nicholas Roerich as honorary president. The group's first annual report was issued the following year. The group does not appear to have lasted much past Nicholas Roerich's death in 1947. The end of World War II saw the resurgence of previous divisions between the two nations. The expansion of Soviet influence into Eastern Europe following Germany's defeat worried the liberal democracies of the West, particularly the United States, which had established virtual economic and political primacy in Western Europe. The two nations promoted two opposing economic and political ideologies and the two nations competed for international influence along these lines. This protracted a geopolitical, ideological, and economic struggle—lasting from the announcement of the Truman Doctrine on March 12, 1947 until the dissolution of the Soviet Union on December 26, 1991—is known as the Cold War, a period of nearly 45 years. The Soviet Union detonated its first nuclear weapon in 1949, ending the United States' monopoly on nuclear weapons. The United States and the Soviet Union engaged in a conventional and nuclear arms race that persisted until the collapse of the Soviet Union. Andrei Gromyko was Minister of Foreign Affairs of the USSR, and is the longest-serving foreign minister in the world. After Germany's defeat, the United States sought to help its Western European allies economically with the Marshall Plan. The United States extended the Marshall Plan to the Soviet Union, but under such terms, the Americans knew the Soviets would never accept, namely the acceptance of free elections, not characteristic of Stalinist communism. With its growing influence on Eastern Europe, the Soviet Union sought to counter this with the Comecon in 1949, which essentially did the same thing, though was more an economic cooperation agreement instead of a clear plan to rebuild. The United States and its Western European allies sought to strengthen their bonds and spite the Soviet Union. They accomplished this most notably through the formation of NATO which was basically a military agreement. The Soviet Union countered with the Warsaw Pact, which had similar results with the Eastern Bloc. Détente began in 1969, as a core element of the foreign policy of president Richard Nixon and his top advisor Henry Kissinger. They wanted to end the containment policy and gain friendlier relations with the USSR and China. Those two were rivals and Nixon expected they would go along with Washington as to not give the other rival an advantage. One of Nixon's terms is that both nations had to stop helping North Vietnam in the Vietnam War, which they did. Nixon and Kissinger promoted greater dialogue with the Soviet government, including regular summit meetings and negotiations over arms control and other bilateral agreements. Brezhnev met with Nixon at summits in Moscow in 1972, in Washington in 1973, and, again in Moscow in 1974. They became personal friends. Détente was known in Russian as разрядка (razryadka, loosely meaning "relaxation of tension"). The period was characterized by the signing of treaties such as SALT I and the Helsinki Accords. 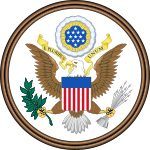 Another treaty, START II, was discussed but never ratified by the United States. There is still ongoing debate amongst historians as to how successful the détente period was in achieving peace. The period of détente ended when the Soviet Union invaded Afghanistan in 1979. The United States, Pakistan, and their allies supported the rebels. To punish Moscow, The U.S. pulled out of the Moscow Olympics. President Jimmy Carter imposed an embargo on shipping American wheat. This hurt American farmers more than it did the Soviet economy, and President Ronald Reagan resumed sales in 1981. Other nations sold their own grain to the USSR, and the Soviets had ample reserve stocks and a good harvest of their own. Reagan escalated the Cold War, accelerating a reversal from the policy of détente which had begun in 1979 after the Soviet invasion of Afghanistan. Reagan feared that the Soviet Union had gained a military advantage over the United States, and the Reagan administration hoped to that heightened military spending would grant the U.S. military superiority and weaken the Soviet economy. Reagan ordered a massive buildup of the United States Armed Forces, directing funding to the B-1 Lancer bomber, the B-2 Spirit bomber, cruise missiles, the MX missile, and the 600-ship Navy. In response to Soviet deployment of the SS-20, Reagan oversaw NATO's deployment of the Pershing missile in West Germany. The president also strongly denounced the Soviet Union and Communism in moral terms, describing the Soviet Union an "evil empire." In December 1989, both the leaders of the United States and the Soviet Union declared the Cold War over, and in 1991, the two were partners in the Gulf War against Iraq, a longtime Soviet ally. On 31 July 1991, the START I treaty cutting the number of deployed nuclear warheads of both countries was signed by Soviet General Secretary Mikhail Gorbachev and U.S. President George Bush. However, many consider the Cold War to have truly ended in late 1991 with the dissolution of the Soviet Union. ^ "United States". Encyclopædia Britannica. Retrieved January 31, 2010. ^ "Soviet Navy Ships - 1945-1990 - Cold War". GlobalSecurity.org. ^ a b a1c80d6c8fdb/UploadedImages/Mitchell%20Publications/Arsenal%20of%20Airpower. pdf "Arsenal of Airpower" Check |url= value (help). the99percenters.net. March 13, 2012. Retrieved July 28, 2016 – via Washington Post. ^ Donald E. Davis and Eugene P. Trani (2009). Distorted Mirrors: Americans and Their Relations with Russia and China in the Twentieth Century. University of Missouri Press. p. 48. ^ Kendall E. Bailes, "The American Connection: Ideology and the Transfer of American Technology to the Soviet Union, 1917–1941." Comparative Studies in Society and History 23#3 (1981): 421-448. ^ Dana G. Dalrymple, "The American tractor comes to Soviet agriculture: The transfer of a technology." Technology and Culture 5.2 (1964): 191-214. ^ Paul F. Boller (1996). Not So! : Popular Myths about America from Columbus to Clinton. Oxford UP. pp. 110–14. ^ Justus D. Doenecke and Mark A. Stoler (2005). Debating Franklin D. Roosevelt's Foreign Policies, 1933-1945. pp. 18. 121. ^ Edward Moore Bennett, Franklin D. Roosevelt and the search for security: American-Soviet relations, 1933-1939 (1985). ^ "National Affairs: Anniversary Remembrance". Time magazine. 2 July 1951. Retrieved 2013-10-12. ^ "American-Russian Cultural Association". roerich-encyclopedia. Retrieved 16 October 2015. ^ "Annual Report". onlinebooks.library.upenn.edu. Retrieved 30 November 2015. ^ "The five Lend-Lease routes to Russia". Engines of the Red Army. Archived from the original on 4 September 2013. Retrieved 12 July 2014. ^ Motter, T.H. Vail (1952). The Persian Corridor and Aid to Russia. Center of Military History. pp. 4–6. Retrieved 12 July 2014. ^ Donald J. Raleigh, "'I Speak Frankly Because You Are My Friend': Leonid Ilich Brezhnev’s Personal Relationship with Richard M. Nixon." Soviet & Post-Soviet Review (2018) 45#2 pp 151-182. ^ Craig Daigle (2012). The Limits of Detente: The United States, the Soviet Union, and the Arab-Israeli Conflict, 1969-1973. Yale UP. pp. 273–78. ^ Barbara Keys, "Nixon/Kissinger and Brezhnev." Diplomatic History 42.4 (2018): 548-551. ^ "Detente Wanes as Soviets Quarantine Satellites from Polish Fever". Washington Post. 1980-10-19. ^ "The Cold War Heats up – New Documents Reveal the "Able Archer" War Scare of 1983". 2013-05-20. Bennett, Edward M. Franklin D. Roosevelt and the Search for Victory: American-Soviet Relations, 1939-1945 (1990). Cohen, Warren I. The Cambridge History of American Foreign Relations: Vol. IV: America in the Age of Soviet Power, 1945-1991 (1993). Crockatt, Richard. The Fifty Years War: The United States and the Soviet Union in world politics, 1941-1991 (1995). Dunbabin, J.P.D. International Relations since 1945: Vol. 1: The Cold War: The Great Powers and their Allies (1994). Foglesong, David S. The American mission and the 'Evil Empire': the crusade for a 'Free Russia' since 1881 (2007). Gaddis, John Lewis. The United States and the Origins of the Cold War, 1941-1947 (2000). Glantz, Mary E. FDR and the Soviet Union: the President's battles over foreign policy (2005). Jensen, Ronald J. The Alaska Purchase and Russian-American Relations (1973). LaFeber, Walter. America, Russia, and the Cold War 1945-2006 (2008). Leffler, , Melvyn P. The Specter of Communism: The United States and the Origins of the Cold War, 1917-1953 (1994). Saul, Norman E. War and Revolution: The United States and Russia, 1914-1921 (2001). Saul, Norman E. Historical Dictionary of Russian and Soviet Foreign Policy (2014). Sibley, Katherine AS. "Soviet industrial espionage against American military technology and the US response, 1930–1945." Intelligence and National Security 14.2 (1999): 94-123. Stoler, Mark A. 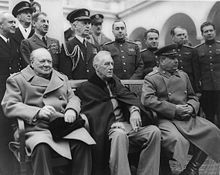 Allies and Adversaries: The Joint Chiefs of Staff, the Grand Alliance, and US Strategy in World War II. (UNC Press, 2003). Taubman, William. Stalin’s American Policy: From Entente to Détente to Cold War (1982). Thomas, Benjamin P.. Russo-American Relations: 1815-1867 (1930). Trani, Eugene P. "Woodrow Wilson and the decision to intervene in Russia: a reconsideration." Journal of Modern History 48.3 (1976): 440-461. Unterberger, Betty Miller. "Woodrow Wilson and the Bolsheviks: The 'Acid Test' of Soviet–American Relations." Diplomatic History 11.2 (1987): 71-90. White, Christine A. British and American Commercial Relations with Soviet Russia, 1918-1924 (UNC Press Books, 2017).